In comments at Kartikeya's blog there was a little aside about Samit Patel's conversion rate – he has only 10 first-class centuries, despite reaching fifty 34 times. Kartikeya said that such a low conversion rate was typical of players who bat at 6 or 7, and gave the example of VVS Laxman. The breakdown of Laxman's record is indeed stark: batting at 6, he averages 51 and has made 5 centuries having reached fifty 25 times; batting at 3, he averages 47 and has made 4 centuries having reached fifty 10 times. The obvious question is, is this typical? This seems like as good an excuse as any to use the aside mentioned at the bottom of this post. 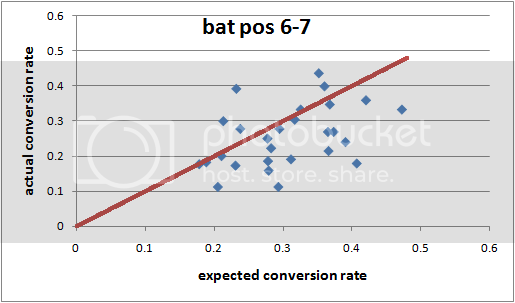 In that basic model, batsmen effectively bat like they average 2 runs more per innings once they get off the mark. So, their conversion rate from 50 to 100 should be, on average, exp(-50/(avg+2)). The red line is y=x. There are 79 batsmen above the line and 75 below, so the model seems pretty decent. Only 6 of the 27 batsmen are above expectation, presumably because they're left stranded or have to start hitting out with 9 wickets down. Laxman is the point (0.406, 0.179). He's on the bottom edge of the scatter, so his very low conversion rate somewhat unusual, even for lower-middle order batsmen. The regression line forced through the origin is y = 0.82x. Returning to the "purer" sample of top-order batsmen, we can ask whether conversion from 50 to 100 is a skill. Using the same method as in the post I linked to earlier, we can treat "scoring a century, having reached fifty" as a binomial random variable, which happens with probability p = exp(-50/(avg+2)). If a batsman has reached fifty N times, then we can calculate z = (actual number of hundreds - Np) / sqrt[Np(1-p)]. If "scoring a century, having reached fifty" is a skill separate from the batting average, then we'd expect the standard deviation of z's to be greater than 1. As it happens, the standard deviation is 0.93. Perhaps that'd increase a little bit if you treated not-out innings between 50 and 99 properly. 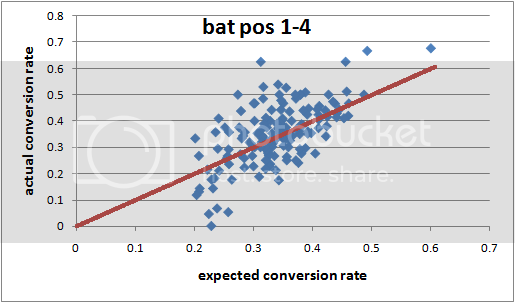 But it looks to me like most of the variation in conversion rates between top-order players is down to differences in their general batting ability (as measured by their average) and random luck.